polish fixation: This mani had me mezmerised! This mani had me mezmerised! Hey guys! Quick post today to show you a recent mani I did. I played around with layering a few new polishes I got together and absolutely LOVED the result!! Is that a gorgeous combo or what?! To get this look I started with one coat of Cherimoya Ruby Step 4 (It's one of their Pebble beach line polishes), then I layered one coat of Bettina Hot Pants over that. 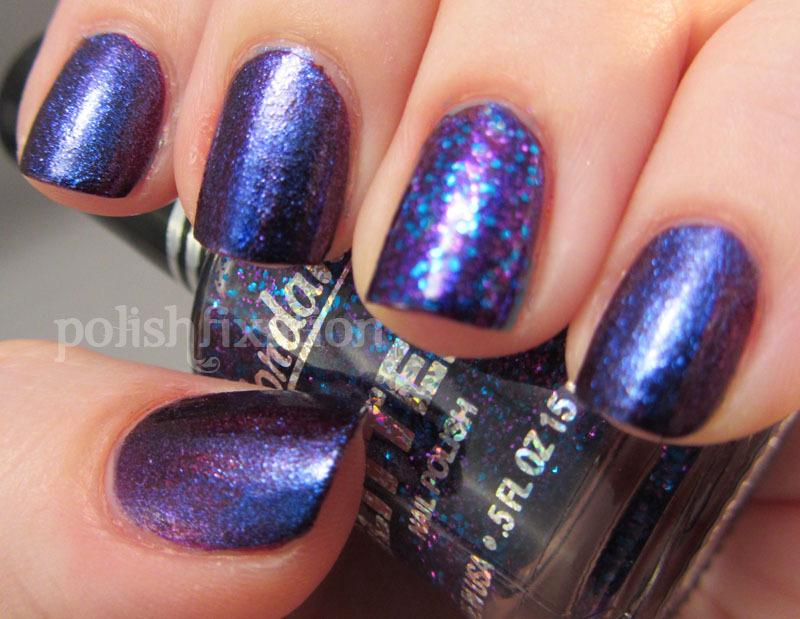 I finished off the look with an accent nail of the new Jordana specialty glitter LA City Nights. I loved the color shift effect this mani had going on with the blue/purple. It was so blingy and fun! What do you think of this look? Do you like layering? It's gorgeous!! I love the blue/purple!! Awesome layering, I love creating different looks by doing that. Purple + blue and you've practically got me drooling. Beautiful!